Proper fluid balance in the womb is necessary for a healthy fetus. 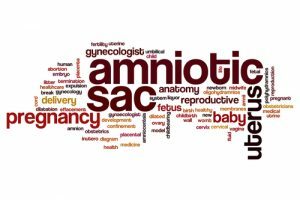 Amniotic fluid creates a cushion that protects your baby from injury, while allowing room for growth, development, and movement. Additionally, it keeps the umbilical cord from being compressed against the uterine wall, and provides a good way to measure fetal urine output – an important measure of baby’s well-being – during the last half of gestation. Too little amniotic fluid can cause serious birth defects. The baby’s lungs may not develop properly, and defects of the arms or legs may result. Another condition, amniotic band syndrome, could also arise. This is caused when the fibrous strands believed to be formed outside of the placenta become entangled with the fetus, causing physical deformities to fingers, toes, arms, legs, and face. About 8 percent of all pregnant women will have low levels of amniotic fluid, and around 4 percent will be diagnosed with oligohydramnios. Since amniotic fluid levels decrease by half once your baby reaches 42 weeks gestation, being past your due date by two weeks or more puts you at risk for this condition. Oligohydramnios causes complications in approximately 12 percent of pregnancies that go past 41 weeks. Doctors measure the amount of amniotic fluid by utilizing one of several methods, the most common of which is the amniotic fluid index evaluation (AFI). A diagnosis of ogliohydramnios would be suspected if the AFI is less than 5 centimeters (or less than the 5th percentile), fluid volume is less than 500mL at 32-36 weeks gestation, or fluid pocket at 2-3 centimeters is absent. When you first discover that you’re pregnant, you are most likely thrilled and prepared to do everything you are supposed to do to deliver a healthy baby. Part of that preparation typically includes placing your trust in team of medical professionals. You should be able to rely on your doctor and the medical staff to properly monitor your pregnancy and do everything in their power to keep you and your child healthy. When something as important as low amniotic fluid is not monitored or treated correctly, and an injury results, you and your baby may have a right to compensation. You may not even realize why your precious little one has been born with a serious injury. You may blame yourself; you might be told that things like this just happen. Do not take the word of the same medical team that may have caused irreparable damage to your child. Call our team of compassionate legal professionals at Thurswell Law. We understand how devastating it can be to find out your child has suffered any type of injury. You have every right to know if it could have been avoided, and a parental responsibility to seek monetary compensation on the behalf of someone so helpless. Call us today at our toll-free number, 1-866-354-5544 for your free, no-obligation consultation. We never charge a fee unless you collect.